Improving the quality of life in American neighborhoods — that’s what CCMC is all about! So it came as no surprise when we learned that one of the associations in our care had been awarded the 2012 Community Service Award by the Irving Parks and Recreation Department and the Parks and Recreation Advisory Board. Congratulations to the Valley Ranch Association! “Our partnership with the city has been fantastic,” explains CCMC community manager Chris Schappaugh, “Our shared resources mean bigger and better opportunities for recreation and lifestyle programs for neighbors. 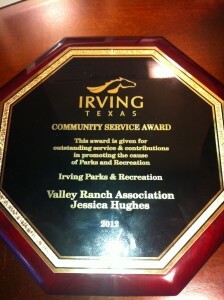 Special recognition goes to lifestyle director Jessica Hughes, who has nurtured and grown this relationship to its fullest potential.” Nominated by the Cimarron Park Recreation Center, the Valley Ranch Association accepted the award last month during a special ceremony where it was recognized for its on-going contribution to the citizens of Irving. This entry was posted in Community Service, CommunityNews. Bookmark the permalink.